Teenage 'Eagle Huntress' Overturns 2,000 Years Of Male Tradition : 13.7: Cosmos And Culture A charismatic teenage girl from Mongolia inspires this year's Sundance Film Festival. Aisholpan Nurgaiv and her family talk with anthropologist Barbara J. King. A still image from the documentary The Eagle Huntress. 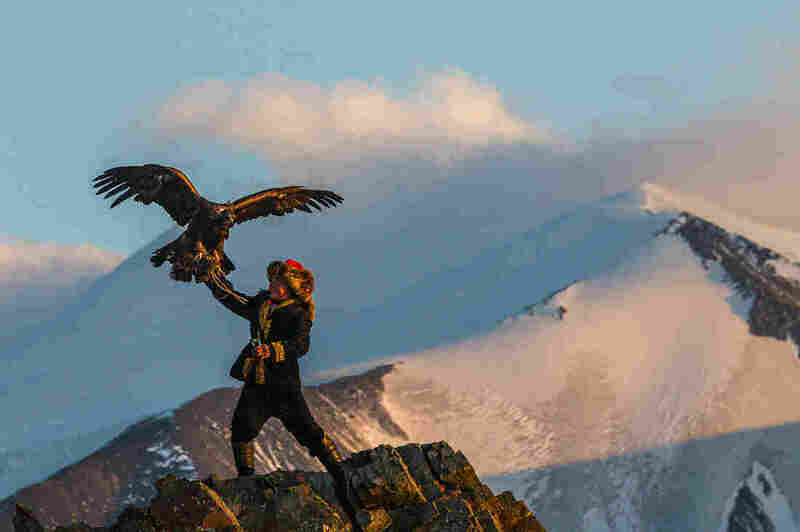 The film follows teenager Aisholpan Nurgaiv, the first female in a traditionally male role, as she trains a golden-eagle chick to hunt in Mongolia. The Eagle Huntress, a documentary film set in Mongolia directed by Otto Bell and starring teenager Aisholpan Nurgaiv, debuted Sunday at Sundance Film Festival in Park City, Utah. With its focus on a charismatic girl who has accomplished something other women have not in 2,000 years — she hunts on horseback with the help of a golden eagle — the film has earned standing ovations. Aisholpan's family members are nomadic Kazakh herders of the Altai mountains region who base their subsistence economy on herding cattle and goats. An essential supplement to the herders' livelihood comes from the practice of training golden-eagle chicks to become their close partners in the hunting of foxes and other small mammals used for food and clothing. This specialized hunting practice — woven into the fabric of everyday life and celebrated at regional competitions — has been an entirely male endeavor throughout its history, passed down in families from generation to generation. Now, just as climate change threatens this way of life and as only 250 eagle hunters remain in Mongolia, Aisholpan is coming to the world's attention as the first woman eagle huntress. I sat down at Sundance for a wide-ranging conversation with Aisholpan; her father, Nurgaiv Rys; her mother, Alma Dalaykan; and also Otto Bell. Aisholpan's cousin, Baldygryn Baidola, translated. As a young child, Nurgaiv told me, Aisholpan helped him care for his own eagle; even then he could see that she was doing things "accurately" and with intense interest. A seventh-generation eagle hunter, Nurgaiv soon encouraged his daughter to become his apprentice — a noteworthy act in a culture where such a thing had simply never happened before. The Eagle Huntress opens not with Aisholpan but with Nurgaiv, who is in the process of releasing his eagle back into the wild after a seven-year hunting partnership. This release is part of the herders' tradition, too: Chicks are taken away from the maternal nest at a young age, but no person is thought to own an eagle. At the eagle's maturity (anywhere between ages 4 and 7), the right thing to do is to let the bird fly free, tradition says. At this point, the hunter begins training all over again with a new chick. The scene in which Nurgaiv releases his eagle is a moving one. First, he strokes the bird with apparent emotion, then he offers the eagle a meal of a sacrificed sheep. This act carries profound meaning in this culture: It's an offering made only to family members at their point of departure (whether departure through death or simply moving away). As we talk, it's clear that Aisholpan does feel that her eagle, named White Wings — the movie shows the bird's capture by Aisholpan herself, working together with her father on a very precarious cliff face — is a new member of her family. White Wings lives inside the family's house. Aisholpan enjoys it most, she told me, when the bird is calm with her, as is often the case; only sometimes, she says, is the eagle unhappy or angry. The two hunters are closely connected emotionally — anyone who meets her (or sees the film) can read the joy and love on Aisholpan's face when she is with White Wings or talking about her. Bell, Nurgaiv and Baldygryn explained the broader situation with eagle hunting and climate change that Aisholpan's family, and many other herders in western Mongolia, now face. The winters are becoming harsher — so much so that a new word in Kazakh has been created (zud) to describe them. At times, the winter's severity is such that whole herds are wiped out; this situation is only made worse because summer rainfall is decreasing. This means less grass is available to fatten the herd animals up enough to help them survive the difficult winters. Sometimes, if the following year is better, the family can recover and continue on living in the traditional way: Other times, a migration to Mongolia's capital city, Ulan Bator, becomes the only recourse. As Bell put it, "There's no recompense for these families." Former herders sometimes have to take up taxi driving or similar jobs in the capital in order to survive. I asked Bell why the film is drawing such strong responses. It embodies, he said, universal themes — a girl who won't be held back by gender-centered tradition; a father-daughter relationship that blossoms — and, besides that, he adds, it's not about a victim. It's not that he dismisses such films, rather he just feels there's room in the world for celebrations, too. And this celebratory journey unfolded right before his eyes. "I don't feel that I directed this film," he said. Instead, "this very visual way of life went on in front of me." The pressing worry now is what may happen to the hunting tradition and, indeed, to the herding families themselves going forward, in this time of accelerating environmental change. In the meantime, The Eagle Huntress is a film in search of a distributor. My best guess is that Otto Bell will succeed in finding one. I hope so, because Aisholpan and her family have remarkable things to tell us.